Yes, folks, it IS April, but for those who plan Halloween events, it’s never too early to start thinking about the spooks. 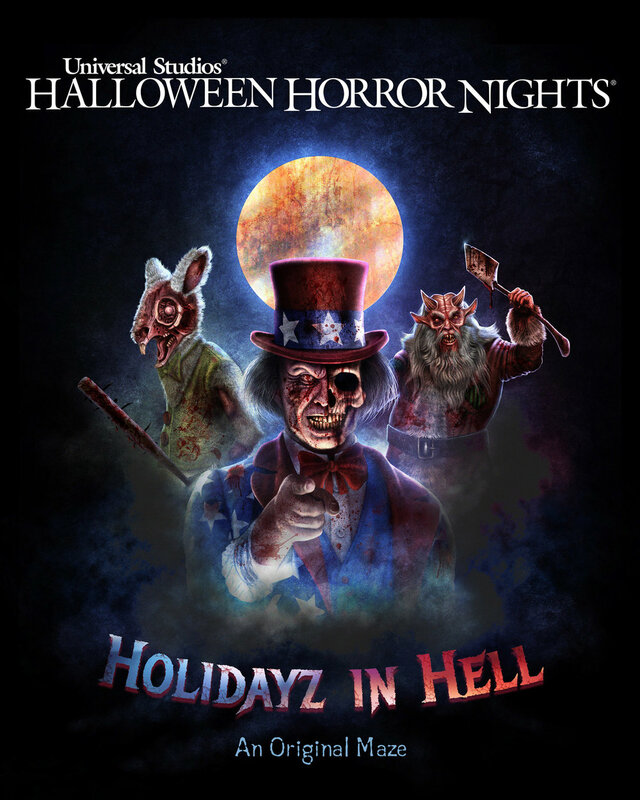 So it comes to no surprise to haunters and haunt fans that news is already unfolding about this upcoming Halloween season, and earlier this week, the unveil came from Universal Studios Hollywood, which announced its second maze for Halloween Horror Nights: Holidayz in Hell! This fan favorite scare zone last year (our favorite) has been reimagined as an original maze—a refreshing offering, since the vast majority of Horror Nights mazes are based on intellectual properties. Joining the recently announced Stranger Things maze (which will feature scenes from season 2 and season 3), Holidayz in Hell will be a part of what promises to be another star-studded line-up. But it really is great to see something a little more creative—even if the scare zone last year rehashed a lot of old scare zone theming—since it tends to yield a less formulaic maze experience. The scare zone had a twisted sense of fun and horror last year, and we hope it carries that same crazed spirit this year! In other news, Universal also recently announced a brand new attraction for 2020, themed after The Secret Life of Pets. Joining the Despicable Me attraction and Super Silly Fun Land, The Secret Life of Pets: Off the Leash! ride will provide a “fully-immersive” experience, with guests assuming the roles of stray puppies joining the cast of the hit movie in looking for a forever home. The attraction will be situated in the home of the old Globe Theater, which has been demolished to make room for the new, incoming ride.